Based on a series of articles written for Barron’s in 1927, Philip Carret writes an extensive introduction to the stock market, while laying the groundwork for market cycles, economic cycles, value investing, biases, and behavior. 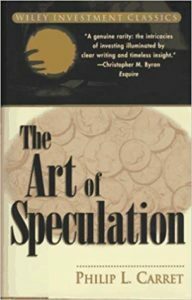 The line between investor and speculator is blurry because every investment comes with some speculative risk. Don’t confuse that line with another — the line between speculator and gambler. One relies on judgment, the other on hope. Even the most conservative investor must speculate with a portion of their funds in order to offset any rise in the cost of living. Prices and values are affected by numerous factors. The difference between bond owners and stock owners is that stock owners share in the unlimited possibilities of growth in a company, while the bond owner is limited to the agreed upon yield and principal. On the downside, in general, bond owners have a legal claim should they not be paid, while stocks owners could easily buy into a business that never sees profits. Stock owners are “compensated” for that extra risk. This is where the original distinction between investor and speculator began. One invested in bonds and speculated in stocks. Stock prices are in a constant state of fluctuation. Mistake #1: Knowing that prices fluctuate, a novice speculator might analyze the cause behind price movements, then analyze stocks that are best positioned to produce a favorable outcome. That same speculator might, instead, realize just how much time and energy that takes and skip it entirely because a friend made a small fortune from a stock tip. If a friend can do it with a stock tip, it must be easy. Mistake #2: Having bought on a tip, the novice has no clue when to sell. The novice is just as likely to a quick profit should the price rise, as they are to hold on — try to break even — should the price fall. Not grasping the difference between price and value, the novice fixates all decision making based on the price paid. Mistake #3: When the stock tip strategy fails, the novice speculator looks for a “system” to time the markets that predict future prices based on past price movements. IF the novice lasts long enough, they eventually realize the market goes through cycles — the markets tend to maintain longer periods of upward and downward trends. But while the market may go through cycles, not all individual stocks follow the same path. The stock market is forward-looking. Changes in the market tend to precede changes in the business cycle. History offers enough examples but Carret referred to the 1907 Panic in the book. On the business cycle/economy during the Panic of 1907: 1906 started with general prosperity across most businesses but with an underlying hostile public sentiment toward business leaders due to an outcry against poor business practices in the press over the past year. Interest rates had also risen from the lows of the prior year. Railroad leaders continued to lay more tracks despite the record high cost of steel and rising cost to borrow. The shifting sentiment drove some states and Congress to pass regulations — railroad rates and meat inspection/food laws — to sooth the public. And on April 18, San Francisco was destroyed by a massive earthquake and fire. The extent of the damage wouldn’t impact the markets for months…until January 1907. The railroads looked to the markets to finance operations, but the money supply was tight. Many banks were left holding unsold bond offerings. The collapse hit in October with the failure of the Knickerbocker Trust Co (a leading NY bank). That kicked off a run on other banks and bank failures, which bled into other industries. It was a full-blown depression that bottomed around November 1908, followed by a mild recovery throughout 1909. On the stock market during the Panic of 1907: The Dow peaked in January 1906, falling to the year’s low around May. Despite the damage in San Francisco earthquake, the Dow recovered close to the peak and traded sideways to end the year. The Dow kicked off 1907 with a break lower in March, a brief recovery in April, sideways till October. The collapse, bottom, and recovery all happened in November 1907. By the time the economy bottomed in November 1908, the Dow was hovering close to its 1906 highs (in other words, the stock market is not the economy — the market is forward looking). Knowing that the market swings through cycles won’t make it any easier to forecast. You can’t expect the current cycle to mirror the past exactly. Each is unique. There are no hard and fast rules for calling the turn. If there was a rule, it would be useless. If everyone knew the market would fall, no one would be a buyer. The best you can do is weigh the multitude of factors to determine a probability of direction. Still, you have to deal with the psychology of the market cycle at the time: Selling stocks at the height of prosperity, when business is great, and everyone is optimistic. Or buying stocks when business is terrible, failure seems imminent, and pessimism rules. Mistake #5: Forgetting/ignoring that the market cycle exists. Bull markets and bear markets end. Borrowing on margin was a big thing in the late 1920s. One could easily pay 20% of the stock price and put the rest on margin. The upside magnifies gains. The downside magnifies losses. A short sale is a bet on pessimism in the face of optimism. The upside gain is limited (the stock can only go to zero). The downside is unlimited losses. Since bull markets are longer than bear markets, short selling “the market” is more likely to be wrong than right. The market averages — Dow, S&P 500, etc. — represent the general trend of the market, not of every stock. Individual stocks fluctuate at different rates, speeds, directions, at the same time. Stocks, industries, sectors, go in and out of fashion. Stocks can remain out of favor longer than an investors patience. On the Balance Sheet: some fixed assets may be worth more than book value, inventory may be worth much less than book value, and “hidden assets” may exist due to depreciation. An increasing profit margin will eventually attract competition. The dynamic nature of business means great companies can become weaker. Weak companies can be made stronger. New companies emerge to fill the gaps overlooked by existing business. And new industries arise through innovation. Good management can make a weak company strong. Bad management can make a strong company weak. A stock’s liquidity — low available float, low avg trading volume — has a big impact on volatility and returns. The process of turning around a poor business, assuming it’s possible, usually takes longer than an investor typically expects. Graham teaches to treat stocks, not as pieces of paper, but pieces of a business. Carret teaches that you should treat your portfolio like a business too. It’s important to have a basic set of rules to follow to help achieve success (though not blindly since there are always exceptions). Diversification lowers the impact of chance and the unknown while allowing room for error. Mistake #8: Becoming emotionally attached to an investment and/or the price paid. A good question to ask for stocks you currently own, “If I had the cash today, would I pick that stock over every other stock available?” If no, then probably best to sell. Patience is one of the most important qualities of success. The goal of an investor is not “realized profits”, but to maximize after-tax returns. Investors make money one of two ways: stock price appreciation or an increase in earning power. If the price rises, it’s no longer undervalued, and earning power has not changed, selling is the normal course of action. But if earning power is rising, there’s no reason to sell…until the information changes. A falling stock price doesn’t necessarily equate to being wrong. Relying on opinions, rumors, tips, and gossips is a strategy doomed to failure.